Its been brought to my attention that I have not yet mentioned the reverse Coriolis effect that occurs when liquids are swirling down a drain in the Southern Hemisphere. Basically, its supposed to swirl in the opposite direction than it does in the Northern Hemisphere. Has something to do with the rotation of the Earth. Well, the reason I haven’t mentioned it is because it’s rather hard to tell which direction the toilet is swirling because of the velocity at which the water hits the bowl. There is really no chance of the survival for anything or anyone who might be lingering around when the toilet flushes. I’m surprised the porcelain is still there. A N.H. (Northern Hemisphere) toilet is more akin to a waterslide in a waterpark (and not one of those Six Flags waterparks either). An S.H. toilet, at a similar scale, is like a #5 rated rapids on the Colorado River. Once you’re among the white water, there is no discerning the particular direction, just that you know the ultimate destination. The swirling drain is a commonly known legend. What is not, however (or maybe it is and I just haven’t heard about it), is the difference between televisions in the S.H. vs. the N.H. Now, bear in mind that we have not gone on a fact-finding mission to determine the veracity of these statements. But, if its not true, it makes for a good myth —- When going to and from New Zealand (as with most other in countries) with electronic gear, there are a few things to take into consideration. U.S. runs at 180V — the rest of the world runs at 240V. U.S. uses NTSC as their video/broadcast format. Most of the remaining world uses PAL (which is a superior format, BTW). These are pretty well known at this point. However, we were told that TVs are made specifically to be used in the Northern Hemisphere OR the Southern — but not both. Evidently, if you buy a TV here, and bring it back to the States, the picture will actually begin to bow in on the sides, giving a kind of pincushion effect. This seems to have something to do with the difference of polarity or magnetism of the Earth’s poles. Again — we can’t verify this, but its rather interesting. Downtown Wellington is filled with cafes, restaurants, and bars. Lots of bars. They are even called “bars”, rather than “pubs” (surprising, given the British history). I don’t know what they would be called in Maori. Probably something like Malataihanukapoapoa. They were smart to choose “bar” — just for the savings in printing costs for signs, flyers, and newspaper adds. All the bars have TVs to watch sporting events (not strange in the least). The biggest event has obviously been the World Cup since we’ve been here. This should not be confused with the America’s Cup (which also takes place in New Zealand this go around). One event is populated with sweaty, dirty men hitting a ball around with their feet and heads. The other has to do with a cruise on a yacht. Both events would be preempted, however, by an All Blacks match. The All Blacks are the local rugby team and they have the same celebrity status as, say, the Lakers in L.A. or the Red Wings in Detroit. The town is crazy for them. I haven’t seen little All Black flags on all the cars, but I’m sure they would sell like Barbra Streisand tickets in West Hollywood. I would have as much chance of picking out an All Black in a crowd as I would Marc Maguire or Barry Sanders (given my less than nil interest in watching professional sports). But, if I were to make a wager, it would be the guy with a black eye and missing teeth, sitting amidst a swarm of admirers and drinking a pint of Steinlager. As a side note, the New Zealand basketball team is the Tall Blacks. No joke. But, I digress with my banter about sports, when the point was to talk about bars. When reading these, keep in mind that I haven’t actually had time to go hang out in bars, so these observations come from just walking around town and peering through windows. The Original Molly Malone’s is around the corner from the hotel. I find it hard to believe that an Irish bar named Molly Malone’s originated in New Zealand. But who am I to question. Looks like a standard Irish pub with the requisite Guinness sign outside. But what struck me as odd is that, mounted against the outside wall, molded statues of toucans carry pints of beer on there beaks to some other place (South America, or Africa, or wherever the toucan’s indigenous habitat is). Like storks delivering babies. And this is an array of 6 or so toucans. I’m not a zoologist, nor am I an expert on foreign cultures, but I do not see a logical correlation between a toucan and the Irish. I’ve already gone through the whole trauma of figuring out why toucans would love the flavors of fruit. Now I have to deal with toucans delivering Guinness to the unfortunates in the world who don’t have a Molly Malone’s to visit. Another bar of note is The Fat Ladies’ Arms. 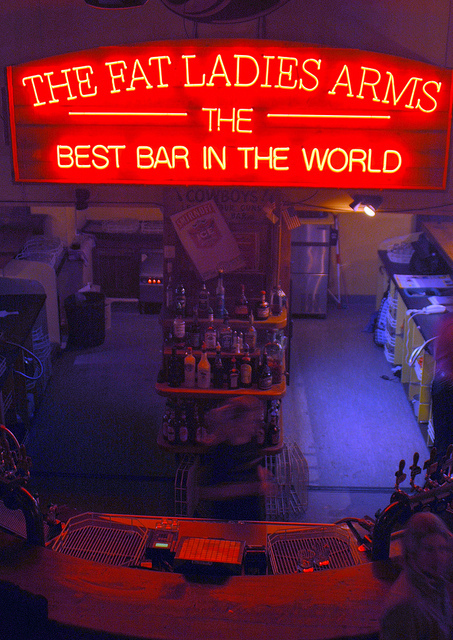 Self proclaimed as “The Best Bar In The World”. This remains to be seen. I would agree that it might be the best NAMED bar in the world. It surely tempts me to go and see what exactly makes this the Best. Its a very bold statement for a bar that is surrounded by other bars. Who knows? Maybe you can Karaoke while watching an All Blacks match? Maybe all the drinks are free all the time? Maybe its government subsidizes to allow such a thing? I’ll let you know when I’ve found the secret. The Golden Fleece of the bar world. I received a shot to work on today finally, so I feel like I actually did something. Granted, I didn’t get it until 3pm, but I got some work done nonetheless. A rep from Electronic Arts came in today to demo The Two Towers Playstation 2 game that is due out next year. The stuff looks like other PS2 stuff. Its a hack/slash action game where you can choose between Aragorn, Legolas, or Gimli and thrash orcs about the head and shoulders. The game benefits by being able to use all the art direction that’s been put into the movies. One brilliant thing about it is that Weta allowed EA to use many of the assets from the film to use in the game. 3D environments, 3D characters and creatures, and motion capture data is the same stuff between the game and the movie. The game just has to make things simpler for the PS2 engine to handle. Something that the guy said is that PS3 (due around XMas 2005) is going to be able to presumably handle 8 million polys at a rate of 60 fps. For those of us in the industry — this means its REALLY fast. For those who are not — this means its REALLY fast. Its much later than I want to be awake, so I am signing off. More of “Reflections with Todd” tomorrow. Todd’s New Zealand tips: Don’t drive through a drive-thru. Its hard enough to understand the person taking the order when ordering in the States. Putting a New Zealand accent into it turns it into a low-brow sitcom sketch of misunderstandings. When in doubt, go inside.